Is ISO 26000 Ready for Revision? 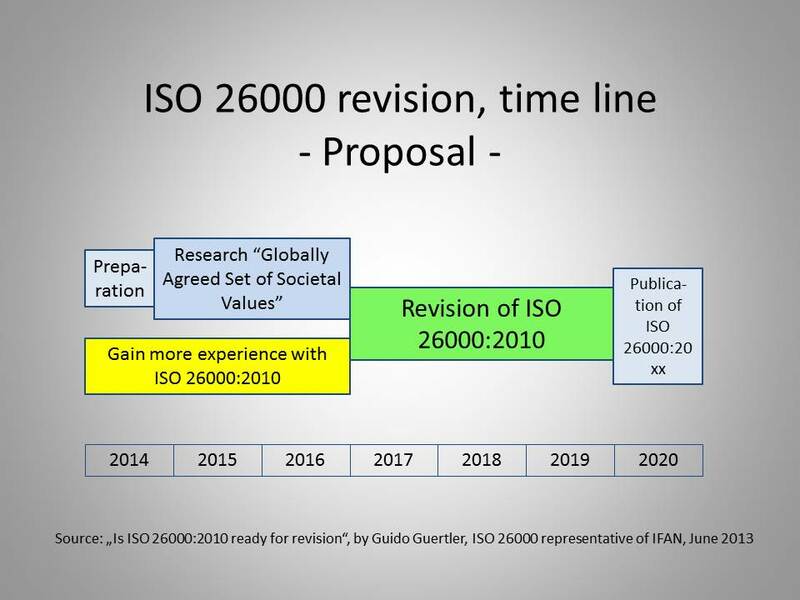 Summary: It seems reasonable to leave ISO 26000:2010 for the time being unchanged in order to gain more practical experience and to develop a revised ISO 26000:20xx on the basis of that increased experience and the outcome of a research project on “Globally Agreed Set of Societal Values. The article, as reproduced on this site, is also available for download in PDF format. A “standard” according to ISO/IEC Guide 2:1996 is defined as ‘A document established by consensus and approved by a recognized body that provides for common and repeated use, rules, guidelines or characteristics for activities or their results, aimed at the achievement of the optimum degree of order in a given context’. Generally, standards are understood as containing normative requirements which one has to fulfill in order to conform to those requirements. Members of ISO 26000 standardization committees involved in the “ISO systematic review” process which is scheduled to start in October 2013. With all its strengths and weaknesses (http://www.26k-estimation.com/html/strengths___weaknesses_of_iso_.html) ISO 26000:2010 is a good achievement, given the circumstances under which it was developed, but it is not good enough to be applicable as broadly as intended. Nevertheless, ISO 26000:2010 should be opened for review only, if substantial improvements in regard of document content and project management seem to be achievable. Incremental improvements will not have merit, particularly not in view of the foreseeable project costs. 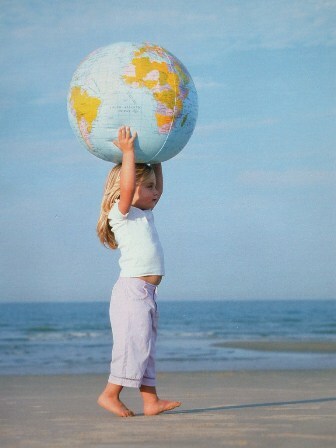 Developing a standard on social responsibility has been an experiment for ISO. It started in 2002 with the setup of a fact-finding committee, called SAG (Special Advisory Group to the ISO/TMB - Technical Management Board). The development time took almost 6 years and ended with the Stockholm conference mid-2004 when results were presented to the general public. With some 450 representatives, this ISO working group was to date the largest working group ever and required skilled management. ABNT and SIS, the Brazilian and Swedish ISO member bodies, did a good job in twin-leading this exceedingly large “group”. ISO experimented with a so-called stakeholder approach, meaning that the content should be developed by representatives of identified stakeholder groups (industry, government, labour, NGOs, consumers, research and services) who had to be nominated by ISO national member bodies and ISO D-Liaison organizations like ICC (International Chamber of Commerce) or IOE (International Organization of Employers) and multiple UN D-Liaisons, while final voting on the draft document was subject to existing ISO rules (one country, one-vote; no vote by stakeholder groups, no vote by D-Liaison organizations). ISO national member bodies had been challenged to gather as many as possible stakeholder groups on their committees. In view of the experimental character of the whole project, it was not too much of a surprise that many (exactly 67,5% of all) national committees did not manage to engage all stakeholder groups at that point in time; http://www.26k-estimation.com/html/iso_and_societal_standards.html#analysis. The development phase was characterized by serious and often tough negotiations of stakeholder interests. ISO rules say that a project is not successful if more than five Working Drafts are needed. In this case the solution was found to produce a WORKING DRAFT 4.1 and 4.2 in order not to exceed the formal limit of 5 drafts. The published ISO 26000:2010 is a good basis for international orientation and use. Since societies develop dynamically over time, have different traditions, cultures and beliefs etc. and want to maintain such differences, it was a good decision to develop a guidance document and not a guideline or a requirements’ standard. Clause 7: Guidance on integrating social responsibility throughout an organization. In figures: There are 7 principles (clause 4) and 7 core subjects (clause 6); the core subjects are subdivided into 37 issues; the whole document comprises a total of 484 recommendations (in all clauses, the author’s count). The substance of these recommendations is good, however, it seems a detriment that the document is generally written in the form and presentation of a textbook, not a standard (“good standards” do not contain redundancies). The volume in and of itself (some 100 pages) is a real hurdle to start using ISO 26000, particularly for smaller organizations. According to ISO rules and practices, each ISO standard should be evaluated every five years as to whether it needs to be revised or reaffirmed. This rule was established in order to ensure that technical standards keep track with technical development and innovation. ISO 26000 is not a technical standard; however, it is subject to the same rules. As is common, “ISO systematic reviews” typically begin two or so years prior to that five year cycle. So, the ISO 26000:2010 “systematic review” may start in October 2013. ISO national member bodies will be asked for their opinions on whether to withdraw, revise/amend or confirm/reaffirm the standard. Some further details are given at http://www.26k-estimation.com/html/review_of_iso_26000_2010_.html. It will be interesting to see whether a possible set up project group will be composed like normal ISO committees by “national delegates” only or again additionally by representatives from D-Liaison organizations. The result of the “systematic review” will be the decision on whether to revise ISO 26000:2010 or not. Observations on ISO 26000 can never claim completeness because societies develop. There is an unlimited variety of user situations: each using organization is specific, each society, and each point in time of societal development, and therefore each social responsibility situation. However, these various observations of facts may give quite a comprehensive picture and may help pave the ground for the decision resulting from the systematic review process. ISO 26000 added to this set and in some way tried to gather the best from all. As regards representativeness, one can consider ISO providing possibly the broadest and most neutral basis. It seems to be interesting that the newly published GRI4 is reported not to mention ISO 26000; one of the reasons could be that ISO 26000 is not for free, in contrast to the other documents listed here. When ISO 26000 was developed, social responsibility related laws and regulations already existed in some way in most countries, surely with great differences in substance and in the level of detail due to significant differences in history and evolution of economies. Major differences can be seen between industrialized countries and countries under development, but also among industrialized countries. The primary obligation of the state/government is to protect its citizens, their health, life, and property. Since the beginning of agrarian civilization and various societies in the fertile crescent or meso-America, this included the application of rules on how to live together. In former times such rules were just not called “social responsibility”. A standard like ISO 26000 is more appreciated in countries without existing detailed socially responsibility related law or poor human rights performance. As mentioned, ISO 26000 offers guidance, i.e. recommendations, proposals, advice, and orientation. Guidance can of course be individually interpreted. In contrast to normative standards, a guidance standard does not tell you how to use it; the manner of using it is totally left to you as the user. So, it is not a surprise that ISO 26000 can be used in most different ways and that a number of different tools came into existence. and/or recommendations, where an organization could take action towards the development of society. In this regard it seems to be worthwhile to search on the Internet e.g. for “ISO 26000 tool” to get an overview. Good tools follow this logic of selection and put the question of an issue’s relevance into the foreground. This is correct and efficient. Other tools list all 37 issues and their recommendations in order to more or less ask how your organization deals with them. This is also correct but less efficient. Tools that offer an ISO 26000 evaluation, an assessment, an audit, or a gap analysis are misleading – to say the least – because they put the voluntary guidance into the form of quasi-requirements which one would be intended to meet. When ISO 26000 was published, a number of user guides appeared on the scene. Their good intent was to make the use of ISO 26000 easier by proposing a practical starting point and steps how further to proceed. A search on the Internet with the parameters “ISO 26000 user guide” reveals a number of such documents. Their common problem, however, is that one has to study even more than the hundred pages of the original document, which is already a problem particularly for smaller organizations. Nevertheless, their positive effect seems to be that they help unravel the inherent complexity of ISO 26000. They also help clarify how to use ISO 26000 correctly and how to communicate results. A remarkable example of ISO 26000 related literature has been published recently in Bangladesh: a small book titled “International Standard Social Responsibility (Implementing ISO 26000 in Bangladesh)”, ISBN 978984 33 73229. It takes marvelously into account the national circumstances and recommends very practical ways, on 44 pages (A5 form) only. Assessment and certification offers, where the recommendations of ISO 26000 were transposed into measurable requirements in order to have a certifiable document “based on ISO 26000” and to offer related services. More examples can be found at http://www.26k-estimation.com/html/misconceptions_and_misuse.html. It seems worthwhile to note that ISO felt the need to establish a process for getting misuse cases notified. In several such cases ISO took/takes immediate action towards the misusing organization, other cases were left to the relevant ISO national member bodies to deal with. The creativity of certification bodies in inventing ways for gaining revenues with ISO 26000 seems to know no bounds; the overlooked problem of course remains that the originators of such offers demonstrate publicly that they have not read or understood the scope of ISO 26000, where certification is explicitly excluded. Particularly all those having been involved in the development process of ISO 26000 could feel encouraged, so an expectation, to use ISO 26000 and to demonstrate the findings. Wouldn’t it be a significant demonstration of support for the proliferation of ISO 26000 throughout the globe, if ISO itself and all its member bodies would show how they use this guidance standard? That seems to be quite a good starting point. ISO 26000 is supposed to be more widely used in industry than in any other stakeholder group, but this should not discourage standardization and certification bodies as well as NGOs and consumer organizations to demonstrate their use of the principles embodied in the guidance standard. It is recommended that ISO national member bodies keep this in mind when deciding about a possible revision, because the overall costs of such a revision may sum up to a comparable magnitude. Since ISO 26000 does not contain requirements, it must not be referenced in contracts or governmental regulation, and it must not be used for assessment or certification. An assessment would need to quantitatively or qualitatively score the ISO 26000 issues (e.g. to what degree the guidance on a particular issue is followed) and would thereby transpose voluntary guidance into measurable requirements. In view of the unlimited differences of societies and their dynamic development over time, it remains appropriate to also publish future editions of ISO 26000 as guidance standards. Rationale: Offering voluntary guidance is the appropriate way; setting standardized requirements for societies would be a useless attempt. And a word on an often proposed “certifiable ISO 26000”: such an initiative would lead to a completely new standardization project, not even to an ISO 26001 since already such a number would be misleading because it would create expectations similar to certifiable management system standards like ISO 9001 or ISO 14001. However, ISO requirements standards must not overlap with other such ISO standards; as one of the basic rules! This means that a certifiable social responsibility management system standard, just to address one area, would not be allowed to transpose the ISO 26000 guidance on the environment into some certifiable material because then it would overlap to the widest possible extent with the ISO 14000 series. Further, ISO is on the way to start a new project on an "Occupational Health & Safety management system standard"; for sure, this will be certifiable, and thereby be another area overlapping with a possible certifiable social responsibility standard. Experience with ISO 26000 showed that it was first widely misconceived and misused. This can be explained by not realizing that there is a difference between the common understanding of a standard (describing requirements) and a guidance standard (offering voluntary recommendations). So, ISO is encouraged to include a new category of a “guidance standard” into the set of its deliverables (like IS International Standard, TR Technical Report, IWA International Workshop Agreement, there should be a GS Guidance Standard). Rationale: A well described type of deliverable “guidance standard” would best help to avoid their repeated misconception and misuse, and thereby significantly contribute to the efficiency of the standardization development process and subsequent use of the standards. In contrast to law, standards are supposed to be voluntary in use; they can be made binding only by getting referenced in contracts or law. However, the scope of ISO 26000 explicitly states that it must not be referenced in governmental regulations or contracts. Normal standards contain requirements, and the standard itself tells you what to do in order to meet them. Since ISO 26000 contains only guidance and no requirements, it cannot be made compulsory and it does not tell you how to use it. As a result, you as the user may decide about how you use it; you don’t need anyone else’s assistance. Rationale: This freedom of use allows for utmost flexibility and is appropriate in view of the unlimited variety of social responsibility situations. ISO 26000, as it stands, can be used autonomously, meaning that every organization can use the offered guidance without external support, be it from advisers, consultants or any other party external to the organization. This seems to be a most valuable feature, particularly in regard of the use by the overwhelming quantity of users, i.e. by small and medium-sized organizations – as mentioned, that’s about 98% of all organizations. Rationale: Small and medium-sized organizations would hardly use ISO 26000 if they would have to purchase external services for doing so. Currently one can look back on 2,5 years of experience with ISO 26000, however, a rather complete overview seems not to be available, which would indicate e.g. per country the sectors and numbers of ISO 26000 users, the types and sizes of organizations and their experiences made. An evaluation of such practical experiences, on the other hand, would provide a sound basis for the “ISO 26000 systematic review” and the possibly following revision of the guidance standard. If, for example, it would turn out that ISO 26000 was not used by organizations of the educational sector (e.g. kindergartens, schools, universities) or in the health care sector, the reasons would need to be found out and taken into account. Otherwise a revision would not lead to a better ISO 26000 version. In consequence, the 2010 edition of ISO 26000 should only be revised if this can be based on practical experiences made by a representative variety of real organizations. It is proposed to conduct a comprehensive study, e.g. by ISO and the involvement of all ISO national member bodies, and accompanied by a professional market research institute. Comprehensive means (a) that all sectors get included, because a revision based on industry experiences only would not be considered sufficient, and (b) that the data also show why ISO 26000 is not or almost not used by a particular sector. Society or economy “sectors” are e.g. education, as mentioned, labour, or public administrations etc. This investigation on the factual use of ISO 26000 needs to be much more than a demonstration of figures how often ISO 26000 has been sold. It is rather recommended that the data include the users’ sector, type and size of the organisation, and the way how ISO 26000 is used. Further an estimation should be given how many users in a sector could be expected. Rationale: A revision of ISO 26000:2010 should be based on representative data of practical experience by all sectors, not only industry and services. To revise ISO 26000:2010 without grounding it on such a data basis would hardly promise real improvements. ISO 26000:2010 describes quite well the WHAT: what organizations are supposed to do in order to be recognized as socially responsible. As regards the HOW, how organizations should perform actions to realize the identified/selected issues, normal management practices apply; social responsibility related actions are not different to manage than other actions. The WHY, why an organization should (possibly more intensively) care for its social responsibility, is addressed in ISO 26000:2010 in a rather general way. A future edition of this document should put more emphasis on the WHY in order to meet the needs for, and benefits of, a socially responsible behaviour more plausible, particularly for small and medium-sized organizations. An actual example: The German Confederation of Skilled Crafts and Small Business (ZDH - Zentralverband des Deutschen Handwerks) denies any need of ISO 26000 for its members. The question, WHY skilled crafts and small businesses should buy and use ISO 26000 to demonstrate their social responsibility, has not found a convincing answer yet, mainly due to a long tradition in organizing this sector (the “guilds” are practised for centuries) and the reality that these organizations act only locally, and if they would not behave in a socially responsible way they would lose reputation and existence. Rationale: If a revised ISO 26000 would put more emphasis on the WHY, it would significantly increase its acceptance and use. There’s a nice saying for bulky documents: “Less is more”. With all respect for the desire to put as much content together as possible, this saying seems to apply to ISO 26000. Taking into account that the vast majority of organizations are small and medium-sized ones (up to 50 employees, as mentioned some 98% of all organizations) and – at least in industry and services – their prime goal is to survive in the market competition, it seems somewhat strange to believe that an owner of such a small organization takes his time to study some 480 recommendations in order to resume that the majority of them would most probably not really apply to his/her organization. Focusing on half the number of detailed recommendations would significantly reduce the volume of the document. Another good option is to change its style from a textbook to a standard which is free of redundancies. This means to redraft the text at all instances where the language is rather turgid and to delete text that doesn’t convey a real meaning. Further, an eye should be kept on the balance of chapters: for example in clause 6 on core subjects the sub-clause on consumer issues “consumes” a disproportionate number of pages and should be reduced. It seems worth noting that most other codes and standards carry similar messages as ISO 26000 on 20 pages or less. During the development process of ISO 26000:2010, it had been repeatedly stated that the same content could easily be expressed on 50 (i.e. half the number of) pages; for a possible revision this opportunity should be used. Rationale: A much smaller document (some 50 pages only) would find many more readers and users; this would significantly contribute to using the substance of ISO 26000 more widely and more efficiently. At several instances within the guidance standard, one can read the claim that all core subjects are relevant to all organizations; that’s simply not true nor even realistic. “All organizations” include for example hospitals and schools. A friend of mine presented the ISO 26000 to a school in the United Kingdom and quickly got the answer: “That’s not really meant for us…!” If one reads for example the recommendations on the core subjects fair operating practices and consumer issues one can understand this reluctance. “All organizations” also includes standards bodies (including ISO and its national member bodies), NGOs, certification and assessment institutes, as mentioned. So far, the use of ISO 26000 by these organizations is not evident. As regards the 37 issues, one can read at various instances that “not all issues are necessarily relevant to an organization.” From there, this is logical: if all issues listed under a core subject are considered not relevant, then the core subject in its entirety cannot be claimed to be relevant. For example: a manufacturer of components for high-voltage grids can determine categorically without hesitation that the whole core subject “consumer issues” is not relevant. Rationale: An ISO guidance standard on social responsibility would increase its credibility if it contained only realistic claims; this would also help increase the number of users, particularly small and medium-sized organizations. Studying the document carefully, one may discover that the overwhelming majority of quoted examples are taken from industry, and primarily from multinational enterprises. That is an industry bias, conflating with the claim of being applicable to all types of organizations. If the guidance standard should be open for revision, the practical examples should be selected in such a way that they fairly represent all types of organizations including governmental administrations and agencies, education related organizations like schools and universities, health care related organizations like hospitals and other service providers, NGOs, non-profit organizations, administrative organizations like standardization bodies, certification institutes, etc. As regards the size of organizations, a revised ISO 26000 should much better take into account that, as mentioned, only some 2% are larger organizations and 98% are small and medium-sized ones; alternatively the claim that ISO 26000 is applicable to all sizes of organizations should be dropped. Rationale: This would help increase the acceptance of ISO 26000. Standardization is characterized by the correct use of terms. Standardization had been created as a technical discipline and technicians would not understand each other if they would use terms with different meanings: they couldn’t arrange any cooperation in designing and developing products, in performing dislocated test activities etc. guidance describes how to handle a topic, its structure, its components, and you have the choice of whether and how to follow the guidance. “manage social responsibility”: one can assume or take a responsibility but one cannot manage a responsibility; one can specify actions for taking responsibility and manage these actions but responsibility cannot be managed. “International norms of behaviour”: this definition describes “expectations”, a term which is per se undefined (a definition should not contain undefined terms). “D.1.5.3 The form of a definition shall be such that it can replace the term in context. This rule de-facto requires a definition to be as short and precise as possible. Rationale: The imprecise use of terms is a major cause for misunderstandings, misconceptions and misuse; it can easily be avoided. Precise use of a standard’s language contributes significantly to its efficient use. It is understood that the ISO system with all national member bodies and working groups at the national and the international level needs to be financed in one way or another. Proven practice is to finance it to the larger part by revenues from sales of standards and to a lesser extent by member fees which the national member bodies pay to the ISO Central Secretariat. It may also be of interest that the expenditures of the ISO system are only a tiny portion of the standardization costs, the much larger portion are the voluntary efforts by all the experts, their man-hours and travel costs. 160 CHF, the national member bodies charge varying prices ; a comparison is available at http://www.26k-estimation.com/html/best_prices_for_iso_26000.html. However, one has to acknowledge that ISO 26000 is not a normal normative standard and in some way competes with other social responsibility related codes and standards, see further up, and that these are available for free. As mentioned, ISO and its national member bodies are organizations as defined in ISO 26000 so that this guidance standard applies to them also. In other words, the standardization organizations should feel encouraged to demonstrate their social responsibility. One option to do so is to provide ISO 26000:2010 and its future editions for free. ISO was approached twice by the leadership of WGSR, the working group having developed ISO 26000, with the intent to provide a free download of ISO 26000:2010 and limit the price for the paper version to printing plus shipping costs. This was considered an ISO contribution to promote societal development. However, ISO Council (some 40 ISO member bodies out of a total of 160+) denied this proposal twice in order to avoid any deviation from current policies and practices. This decision should be revised because ISO as a whole will once again be challenged to demonstrate its social responsibility. ISO should send a signal to the outside world that its society related standards are not for profit. All said up to now is in line with ISO’s conventional proceedings. However, for such an important area as social responsibility, there is great merit to try and provide a more future-oriented guidance standard. A revised ISO 26000 may possibly be published not earlier than 2020. It should be valid from that point in time onwards, be forward looking and also cover the then foreseeable societal needs. And he is right. See also http://www.26k-estimation.com/html/future_development.html. International standards have to address all societies and, to be accepted internationally by them, make sense only if they focus on a globally agreed set of societal values. This globally agreed set of societal values has not been found yet. A professional global research project is needed to identify this set. The current edition ISO 26000:2010 is primarily oriented on existing/practiced Western societal values. Therefore it is a valuable input for such a research project. However, ISO 26000:2010 can only be one contribution, because there are other invaluable documents and practical viewpoints that need to be included in such a global research project. ISO could serve as organizer and should be a major contributor. Well-known representatives of social sciences would naturally be the main contributors. decreasing resources like water, land and food. other areas like “Peace”, “Avoidance of waste and pollution”, or “Reduction of transportation” gain more importance, all under the headline of a socially responsible behaviour. Assuming a three years development time the revised version would be published in 2020 as ISO 26000:2020. A revision should also find a new pricing so that ISO would demonstrate that its Central Secretariat and ISO national member bodies don’t publish societal standards to gain net profit. It seems reasonable to leave ISO 26000:2010 for the time being unchanged in order to gain more practical experience and to develop a revised ISO 26000:20xx on the basis of that increased experience and the outcome of a research project on “Globally Agreed Set of Societal Values ”.